Explore detailed geologic maps; download georeferenced images & reports; view geologic formation information. This database is a compilation of existing information on faults and fault-related folds considered to be potential earthquake sources. Search, view, and download aerial photographs and imagery of Utah. Contains ages and related dating information of sampled geologic materials collected in fault trench investigations to determine the timing of past earthquakes. Mapped to National Wetland Inventory (NWI) standards and reclassified into six wetland types. Access monitoring data from West Desert (includes Snake Valley) and Wasatch Front groundwater monitoring projects. Contains data from over 7900 economic mineral occurrences. Contains major metal production data for over 180 mining districts (updated through 2012). View Canadian National Instrument Technical Reports for mineral properties in Utah. Maps for 58 percent of the abandoned coal mines in Utah. Contains non-confidential old paper well data for non-petroleum exploration holes drilled in Utah. Contains the region’s only publicly available and most complete collection of geologic cuttings and core from Utah. Contains Utah geologic- and wetlands-related scanned documents, photographs (except aerial), and other digital materials from our files and those gathered from other agencies or organizations. Search catalog by words or phrase, title, author, subject, keyword, series, or periodical title. The National Geologic Map Database Project is a collaborative effort primarily involving the USGS and the Association of American State Geologists. This database allows researchers to view scanned logs of Utah oil and gas wells. Conduct a well log search by Section, Township, and Range as well as by map search. A web-based repository for energy and mineral data for the State of Utah. GIS map data files are produced from published or open-filed geologic maps with a variety of spatial data which can include topographic features, geologic units, energy or mineral resources, and geologic hazards. Includes raw 40Ar/39Ar data, whole-rock geochemical data, and other technical laboratory analyses gathered in support of various geologic projects. The NGDS is a DOE-funded distributed network of databases and data sites that collectively form a system for the acquisition, management and maintenance of geothermal and related data. LiDAR data acquired for use in various geologic mapping and research projects. Landslides, fault scarps, and other features that are difficult to detect visually because of vegetation, access, or other issues, may often be clearly shown in LiDAR data. To aid in producing ground-shaking maps, the UGS has compiled databases of shallow shear-wave velocities and deep-basin structures. Provides mostly non-technical information on landslide events that occurred from 1850 to 1978. 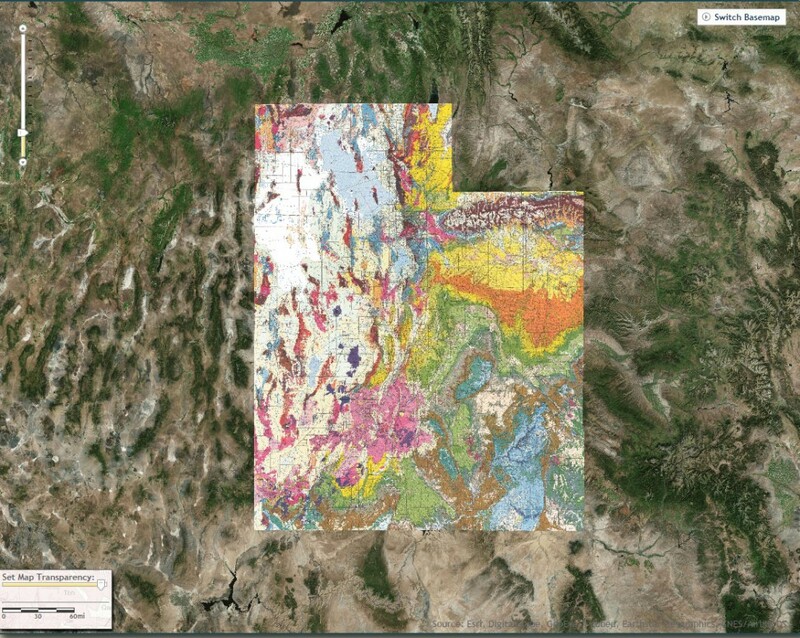 Consists of catalogs for the earthquake epicenters shown on Utah Geological Survey Map 277. Inventory of geologic cuttings and core from Utah stored at the UCRC. The Well & Spring database contains data of 2981 wells, springs, and miscellaneous sites such as collector wells and mines.